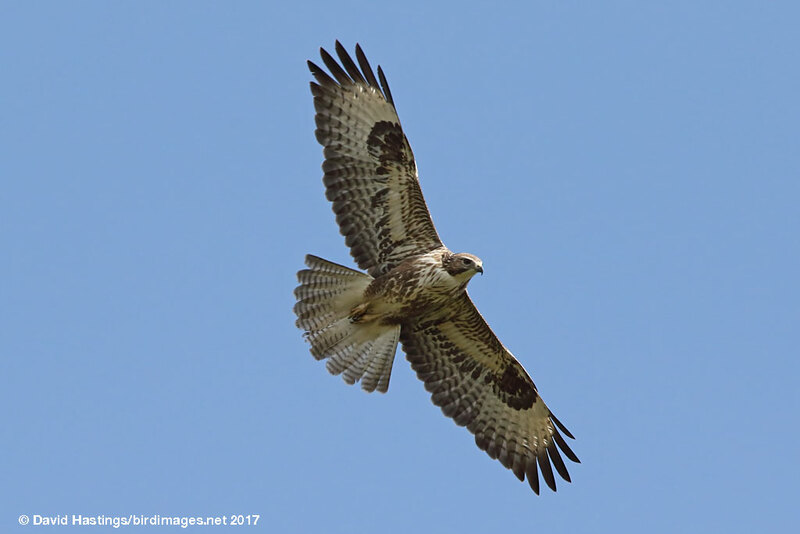 Buzzard (Buteo buteo). Taken at Aston Upthorpe Downs, Oxon., on April 15th 2017. Taken at Aston Upthorpe Downs, Oxon., on April 15th 2017. The commonest and most widespread British bird of prey. When gliding and soaring it will often hold its wings in a shallow 'V' and the tail is fanned. Birds are variable in colour; most are brown, but some are quite pale. It is found throughout the UK, but is largely absent from Ireland. Its breeding habitat is forests or small woods, with access to open land, farmland, meadows or marshes. It nests in trees. Often seen perched on fence posts or telegraph poles looking for prey. Green status. There are between 57,000 and 79,000 pairs in the UK.